Most of our churches probably have a document somewhere that lists the church’s stated core values, which is great. But what’s even more important is the list of unidentified values. Stated values are fine, but are ultimately meaningless unless the church community intentionally embodies them in every way. The unidentified values are the values that a faith community actually lives by, what influences decisions, how success is determined, and why the church goes one direction instead of another. Most churches haven’t throught through their unidentified values and any discrepancy between them and their stated values. But that’s also true for us. As I’ve been interviewing with churches and asking a lot of questions that try to reveal some of the unidentified values a church holds, I’ve been reflecting on some of those values for myself. Knowing what a church’s true values are doesn’t really help me much unless I know what my true values are and how they might or might not align with the church’s. The temptation for me is to list values that I wish I held so that I would appear to be more well-rounded and balanced, but what’s more important is for me to identify what is, not just what I wish was the case. So, here are some of the values that I have in ministry, loosely in order of importance. Sorry I don’t give a lot of detail here — I wrote this mostly for myself, but am happy to share it with you guys. Prayer and listening to the Holy Spirit’s promptings. 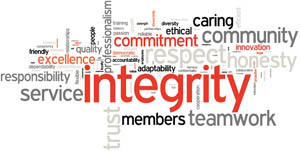 Integrity, living upright, holy and above reproach. Maintaining healthy ministry and personal boundaries for my family. Personal development (both spiritual and professional). Intentionally evaluating the ministry’s spiritual influence and implementing appropriate changes. Serving from identity (doing flows from being). Viewing parents as the teenagers’ primary spiritual leaders. Creativity and expressing myself in ministry in new ways. Authenticity, transparency, being who I really am. Investing into servant leaders, both adults and students. Missions as an intense discipleship and evangelism tool. Lifestyle of worship in both my own life and in the lives of teens. Spiritual formation via experiences. Learning via discovering truths. Practicing spiritual truths in my own life before I teach it and expect students to practice it. QUESTION: What do you value most in ministry?